Your workplace, no matter how benign it might seem, is not a land of candy canes and lollipops. Even in an airy, benevolent office, you could slip, trip or fall in as much time as it takes to click your fingers. Just imagine the scene. You’re whistling happily to yourself as you stroll through your workplace. Then, all of a sudden, BANG. In an instant you’re prostrate on the floor, grabbing the aching bone in your leg with a howl. And these disasters occur all the time. According to government figures, over 78,000 accidents are reported every year. Moreover, the blame doesn’t lie entirely with the victim. When sneering, corner-cutting bosses shirk their health and safety responsibilities, the likelihood of a nasty accident will increase – and for employees, one trip could prove fatal. Enter lawyers, armed with mounds of litigation knowledge and in-depth experience on worker’s rights and safety legislation. If you’ve been in a nasty scrape that isn’t your fault, these are the guys who’ll find the culprit and put them bang to rights. Council muck-ups, employer accidents or road safety disasters – they all fall under the umbrella term of personal injury claims, and all they require is for you to pick up the phone. 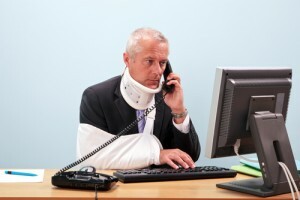 When you give a claims lawyer a call you’ll first have to detail your accident to them. They’ll then assess your claim and decide if it has a leg to stand on. Once the initial appraisal is over, it’s time to find some evidence to support your claim. Your broken leg is a good start, but there’s plenty more out there that could help you out. CCTV footage, witness statements, doctor and police reports, building schematics, employer safety records – these titbits of information could prove to be the linchpin of your case. After this, your representative will barter with your employer. There will be a lot of legal wrangling that, by and large, you won’t be a part of. Instead, you’ll take a backseat until, in more serious cases, you’ll head to court. The courts can be intimidating places to visit, let alone to make a testimony in. But if your lawyer has rehearsed you well enough and you understand the heart of what you’re saying, you’ll breeze through the process like a professional figure skater at the Winter Olympics. Without the courts system in place to hold dodgy bosses to account, workplaces would invariably be harsher, more dangerous environments. And that’s exactly why you have to do your civic duty. So if you’ve been in an accident, you know who to call. What Insurance Do You Need for a Self-build? When is the Deadline Date for PPI Claims?